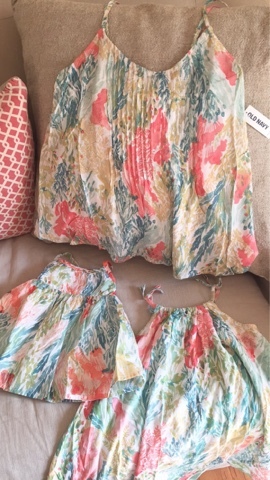 First things first, I have to share the cutest little matching outfits I bought for us to wear this summer! I scooped this trio up at Old Navy recently (online, le duh) and admit that I'm a little too excited than a grown lady should be about matching outfits. I bought a tank for myself to wear with white jeans (it's more fitted up top but flowy in the tummy area, which is my favorite style these days). Camille and Charlotte have matching dresses in 0-3 months and 2T sizes. I'm pretty petite - 5'2" - but I didn't want this to be too short, so I ordered the XS in the regular size instead of petite. It's also available in tall for any of you who are blessed with more height. It's available now from XS through XXL. This one is currently available from 12-18 months up to 5T sizing. This one is currently available from 0-3months up to 18-24 months. Since my iPhone snap leaves a little to be desired, here are the stock photos in a collage I put together to show how they will look. 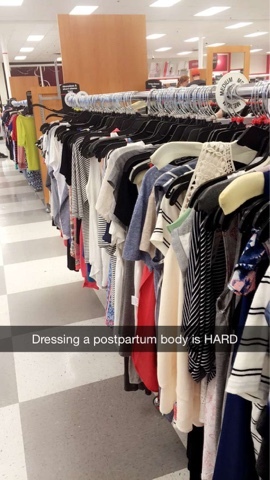 Now, on to the postpartum body. 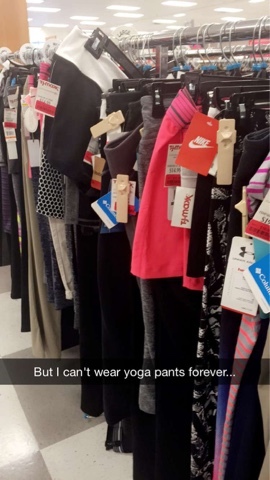 I put some photos up on Snapchat last night (@alizadventures) from a little shopping trip I took. Ian stayed home with the girls while I ran out to TJ Maxx. 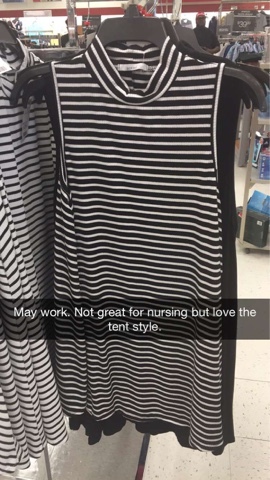 I was tired of my clothes not fitting and I just needed a few new (dark, tent-like) pieces to help hold me over for what will hopefully be a few more weeks or a month. Here are the photos I put on Snapchat. It was actually a fun way to shop -- sort of felt like I was shopping with girlfriends! I wound up getting four items and only paid $6.12 after some gift cards I had. Not too bad! 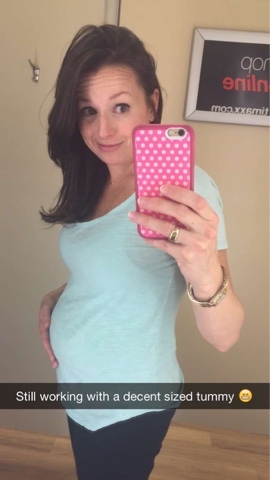 The truth about pregnancy for most ladies is that the weight does not "fall right off." Even if the scale says what it used to, your body may have taken on a new shape all together. Like, whose belly button is that?!?! All very worth it, but it makes feeling comfortable in your skin a little challenging for a while. I would guess that I'm still a good 8-10 pounds above my "normal" weight right now, and it's all right in my lower tummy. I wear dark colors a lot, steer clear of stripes, and love my shapewear! Ha! 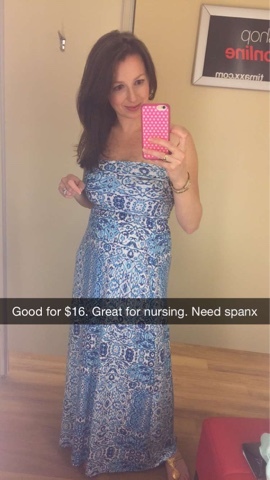 So, if you have found any tips or tricks for dressing a post-partum body that really worked for you, hit me up! I'd love to hear from you. I think you look great! 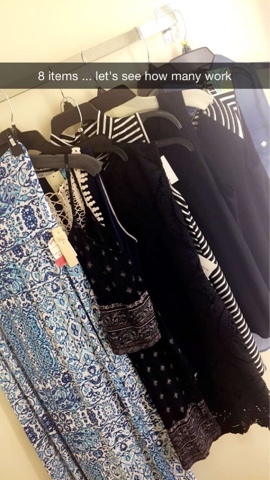 And seriously, I was just thinking when you posted an IG photo the other day how great you looked and how you seemed to be back to your pre-pregnancy size so quickly--so clearly you hide it well! I appreciate the honestly about not losing the weight celebrity-fast and I love both of the above dresses you seem hesitant about! Omg this is SOOOO cute! What a great matching find! After my second (my belly shoots out like a cannon when pregnant...huge!) I had this "pooch" above my belly button. After my first it was all below. It's been hard to get it to go away completely. So now I stick with mainly looser tops that have a fun pattern to them. The best hiders of the body I'll probably always have now. Haha. You look great, mama! I'm 8 months post partum, back to pre baby number, and still learning to dress the new bod. 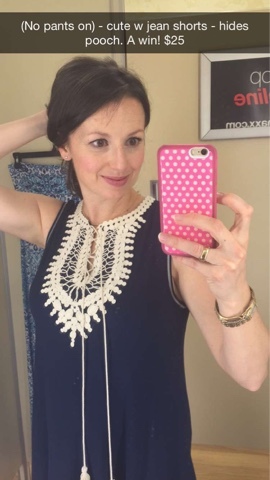 Fortunately, I love a good loose fitting top! bahhaah Lawter and I have the same matching set! I love matching us (dorky, I know). The scale isn't my post partum problem- it's the shape of things and the desperate need for TONING some things up asap!! You look fantastic girl. Um. I LOVE this post! First- totally obsessed with your matching outfits! I'm so bummed the girls dresses don't come in bigger sizes or I would totally be getting them for my girls and me!! 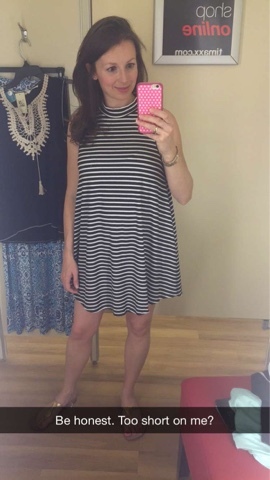 Second- you know I totally get the postpartum bod ;) I just picked up a maxi dress from TJ Maxx to wear to a wedding in a couple of weeks and I hope it will work :) fingers crossed it can hide all the lumps and bumps I currently still have! Ha! Love the matching outfits!! And isn't it a crazy feeling when you try something on and it's cute but you know you're just. too. old. Tie dye gets me every time! Totally just ordered the tank and baby dress for my newborn and me! Appreciate your honesty about dressing a postpartum body- lululemon wunder unders have been my saving grace as the waistband keeps things sucked in! Hoping to be back in my pre-preg shorts this summer but if not, I'll be living in flowy dresses. It's been tough finding things that hide my belly AND are feasible to nurse in. I love everything you picked! The postpartum body is so hard especially going into summer. My babies were fall babies so I covered myself with leggings and big sweaters all winter. Those matching outfits for you and the girls are darling!! How fun to be able to match!! Those matching outfits are soo adorable - can't wait to see all 3 of y'all in them!! The things you picked up from TJ MAxx are super cute too!! Yep, ordered those mommy-and-me items right up! 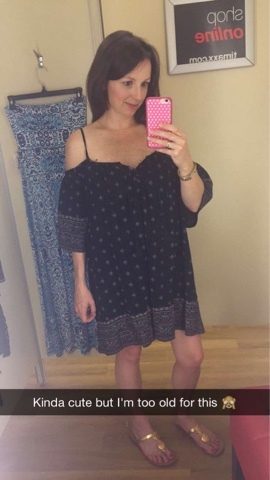 Thank you for sharing, and you look amazing! Love your honesty - so refreshing! But you look great, sweet girl! 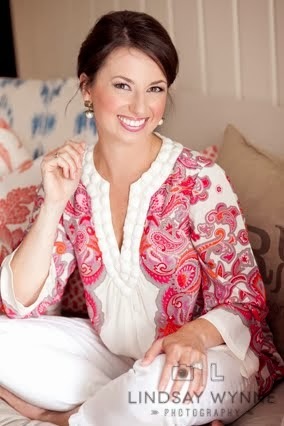 And I love that sleeveless top you chose with the ivory embroidery. Great find! I can definitely relate! I've gained a little weight, and getting dressed in the mornings no fun...but I don't even have a baby as an excuse!